This time of the year is so magical. Stores get a complete makeover, streets that are usually grungy are now sprinkled with twinkling lights and spirits are just a little higher than normal. It’s Christmas and New York City is buzzing with it. 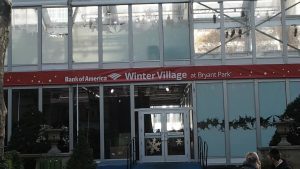 I recently took a day trip down to the Big Apple for the express purpose of going to the Winter Village at Bryant Park put on by the Bank of America. 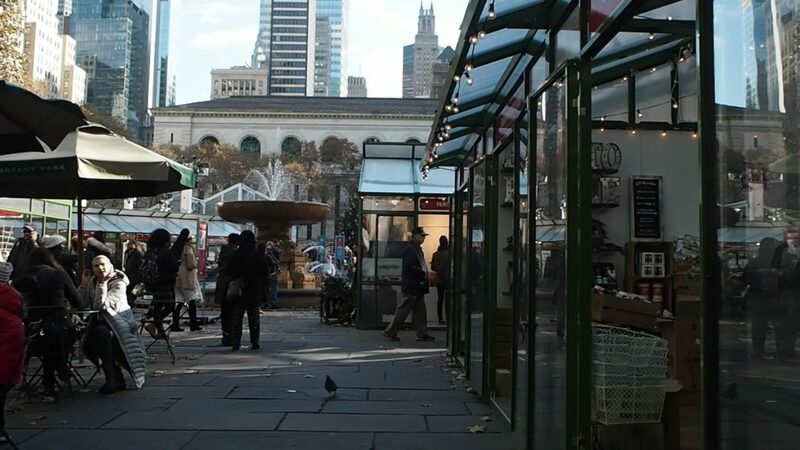 I’ve read about the winter markets in Europe and have seen the pictures and I wanted to see if Bryant Park evoked that same bazaar type quality that I’ve only read about. I have to say, it wasn’t exactly what I expected. More boutique shopping less market. 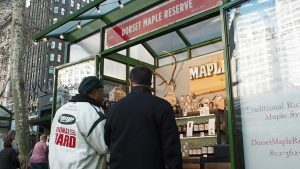 I think that was part of my disenchantment with the Winter Village is that I thought I would be more of a farmer’s market feel instead it was a series of boutique pop up stores. These were not without their charms. Each store was crammed full of merchandise with little room for more than 3-4 patrons at a time. There was quite a variety on offer from books to bakery goods and everything in between. However, everything was expensive and there were no deals to be had. If any of you have ever been to Bryant Park at any other time of the year, it’s a pleasant place to relax with little eateries and places to grab a coffee. During the Winter Park season, they set up an ice skating rink framed by a beautiful big Christmas Tree. 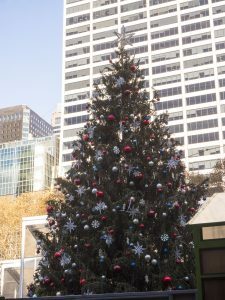 The rink is not half as crowded as Rockefeller center, which is a great option if you want to skate in the city and don’t want to wait on obscenely long lines. Continuing with the Christmas spirit all of the little pop-up shops had strings of twinkle lights framing the entrance, which, I’m sure would be beautiful at night. Along the South side of the park were two rows of food vendors. Everything from Indian to donuts. 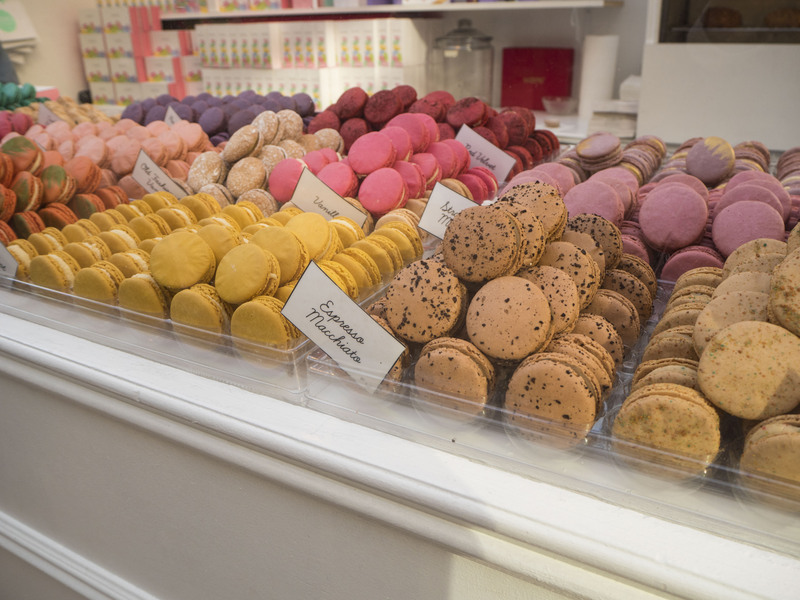 I have never understood the obsession some people have with macarons. My brother was gushing about them, saying they are the best cookie ever. 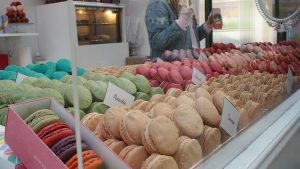 I had a macaron in Montreal this summer and was not impressed. I didn’t get it. Woops! changed my views on macarons. Situated on the East side of the park Woops! offers a variety of flavors my favorite was the raspberry but we sampled a slew of them, red velvet, vanilla latte, espresso, coconut, rose, and honey lavender to name a few. For $25 you can take a box of 12 home to sample. There may be better macarons out there but at least now I understand why they are so loved. The next best thing I had there was a cup of hot chocolate from No Chewing Allowed. This chocolatier wants you to allow the chocolate to sit on your tongue and dissolve, so you can fully appreciate the flavors. Before pouring my hot chocolate the vendor dropped a chunk of semi-sweet chocolate in the bottom of the cup. The addition made the drink more of a sipping chocolate than a traditional hot chocolate. It was very rich and thick. I’m sad to say I couldn’t finish it. I was looking at the Winter Village as a destination when it should really just be a pit stop. 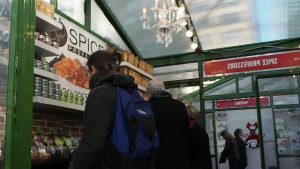 There are better markets in the city where you can get better deals like Union Square. I do think it’s a nice way to spend a couple of hours with friends and you can find some interesting wares. Until next time.